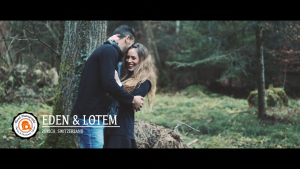 As a wedding photographer and wedding videographer from Zurich, Switzerland, I had the great pleasure to film this beautiful engagement video for my friend, Lotem Zino, a very talented, professional football player from Israel, and his gorgeous girlfriend, Eden Shahaf. We spent an amazing day with lots of fun and laughter. Now that the wedding has already taken place, I would like to thank you both for an amazing party and wish you the best of luck for your married life!